Fox Nation supposedly is about "civility and respect;" yet, at every opportunity, it vilifies Bill Maher, a comedian, for blaspheming against sacred right wing cows. Course when right wing jokers like Rush Limbaugh, Greg Gutfeld, Brad Stine, or Stephen Crowder engage in uncivil and disrespectful discourse aimed at Democrats and others deemed anathema to the party of God, it's all fine and dandy. And speaking of God, his other son, Tim Tebow, was the subject of an irreverent tweet from Bill Maher which, for Fox Nation, is truly blasphemous. And as Fox Nation is a wrathful nation (but very Christian), they pointed their vorpal sword at Bill Maher by referring to him (Was a lede most of the day), once again, as "Pig Maher." Not only is this not in keeping with promoting civility and respect; but it's so junior high. Who writes for Fox Nation - Beavis and Butthead? 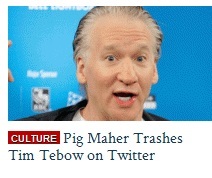 Hopefully there won't be death threats on this latest in the "Pig Maher" series. Given the score of the last Broncos game, Maher might be right. "Jesus f*&cked" Tim Tebow bad." Eww, Fox Nation Christians are upset. And as if Bill Maher really cares what they think! Gee, try not to hold back so much, Dustin! And Aria, we’re exactly in agreement! @MLP: You know better than that. You can’t have a Maher thread without at least three open threats. Just like you can’t have an obama thread without massive racism. Or a recent Pelosi thread without at least 100 obscenely sexist comments on it. Tebowing looks like people doing an impression of that statue, “The Thinker.” The way he plays is more reminiscent of Venus with no arms. When Tim Teeboner’s brief NFL career crashes and burns, will he become a Fux News contributor? A masculine version of Father Spanky Morris? “Hopefully there won’t be death threats on this latest in the “Pig Maher” series." Uhhhh, I’d count on it. The ‘stoopit’ thrive on making threatening statements that exhibit great courage and bravado…..anonymously, of course. That’s “Frabtious” Just for the record. Hey Priscilla: Vorpal sword. Love it. Oh, fraptious day! As for the article: Do these ‘Christians’ really think that Jesus ignores the daiy goings on in Rwanda and the Congo, while giving his full attention to American Football?